New Real Madrid 2018/19 Home Shirt | Back to basics! Los Blancos is now ready for a new season full of new challenges. To get the best possible start to the new challenges adidas has made a new 2018/19 Home Shirt, which goes back to the basics of the Real Madrid shirt. Let’s get through the details of the shirt. You either love them or hate them. But one thing you can’t take away from Los Blancos is their star packed team. Once again, they showed their class, even though everyone wrote them off to get their 13th Champions League trophy. The next season we are going to see Ronaldo, Isco, Modric and the rest of the Real Madrid team in a classic white shirt with black details. 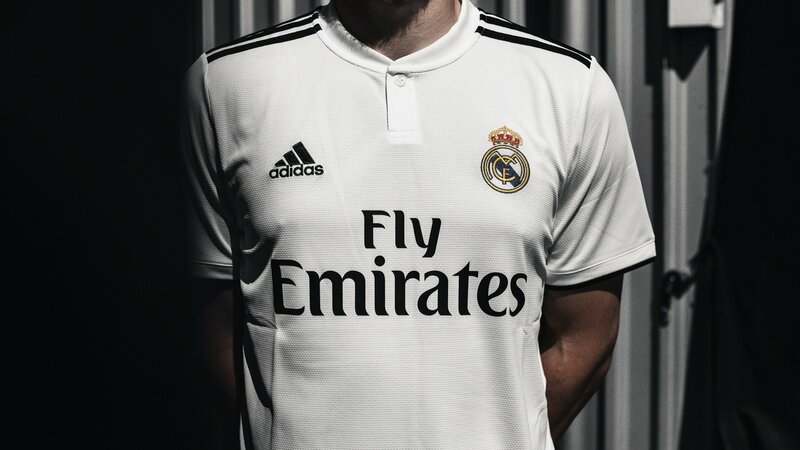 The Real Madrid shirt is kept simple and is all white, while the black details are applied on the shoulders in form of the adidas three stripes and the Fly Emirates logo on the chest. The shorts and socks are also made in total white with black details and the socks have a black box with ‘RMCF’ written in it. This is the first Home Shirt since the 2008/09 season where Real Madrid gets a white and black combined Home Shirt. Previously season we have seen a white Home Shirt combined with a colourful designs. The new shirt is all about going back to basics, and getting as many trophies as possible in the new 2018/19 season, getting back on track again. But the Home Shirt is not the only shirt dropping from adidas. The Real Madrid 2018/19 Away Shirt is also ready for the stars of the Spanish Capitol club. The Away Shirt is predominantly Navy with some dark grey trims around the stripes on the shoulders and collar. The shorts and socks are the same as the Home Shirt in terms of design, so you get a simple look and the blocked texts on the socks. You can already pre-order your new Real Madrid 2018/19 Home and Away Shirts already from today!